The Fate of All Carbon | Watts Up With That? The figure is in millions of barrels of oil and its equivalent in energy content per annum. Peak production is in 2025. Coal production keeps rising until about 2050 but that is more than offset by the declines in oil and natural gas. China has the largest coal reserves on the planet of about one trillion tonnes. The United States is next with about 250 billion tonnes. There is high quality data on atmospheric carbon dioxide from 1959 from the Mauna Loa observatory. Plotted against the historic fossil fuel production profile, there is a good match fuel burned and what remained in the atmosphere. Carbon dioxide has a half life in the atmosphere of about five years. It is very rapidly exchanged with the biosphere and the top 100 metres of the ocean. There is almost no exchange between the atmosphere and the ocean below 100 metres. The oceans have fifty times as much carbon dioxide as the atmosphere and eventually the atmosphere will be in equilibrium with the whole ocean column instead of the top 100 metres. Note the dip in the rate of increase in 1992 associated with the cooling caused by Mt Pinatubo. Similarly, the current solar-driven cooling will be associated with a flatlining of the atmospheric carbon dioxide level as the cooling oceans will absorb more carbon dioxide. The oceans turn over every eight hundred years. So at one end of the oceanic conveyor, water in equilibrium with the current atmospheric carbon dioxide level is sinking towards Antarctica and at the other end, water in equilibrium with the pre-industrial level of carbon dioxide of about 300 ppm is coming to the surface and immediately taking carbon dioxide from the atmosphere to become in equilibrium with the current carbon dioxide level. The sum of these two effects is to take 0.25% of the carbon dioxide in the atmosphere and dissolve it in the oceans. If it weren’t for this effect, burning all the rocks we could economically burn would take the atmospheric carbon dioxide level to about 600 ppm. With it, the peak is going to be about 522 ppm in 2130. From the current level of 390 ppm and with the heating effect of carbon dioxide being 0.1°C per 100 ppm, the consequential increase in atmospheric temperature will can look forward to may be another 0.15°C. This will simply be lost in the noise of the climate system. There is a far greater benefit. The extra 130 ppm-odd from the current level will increase agricultural productivity by 23%. So instead of the world producing 2.2 billion tonnes of grain, the same land area and water will be able to produce a further 500 million tonnes of grain. That increase would be able to sustain about 1,200 million people. Perhaps that is not a sustainable thing because the oceanic turnover will subsequently bury that aerial fertiliser in the deep oceans. This figure also shows why higher atmospheric carbon dioxide levels have such a dramatic effect on plant growth. Plants can’t operate against the partial pressure differential between their cells and the atmosphere when the atmospheric content is below 150 ppm of carbon dioxide. During the depths of the glacials during the current ice age, which is three million years long so far, the atmospheric carbon dioxide level got as low at 172 ppm. Life above sea level came within a hair’s breadth of extinction due to lack of carbon dioxide. At the pre-industrial level of about 300 ppm, only 150 ppm was available to plants. At the expected atmospheric concentration of 522 ppm in 2130, that will be a 150% increase in useable carbon dioxide. The next question is,”When carbon becomes rare and expensive, what will we be driving?” The future doesn’t look too bleak in that regard. 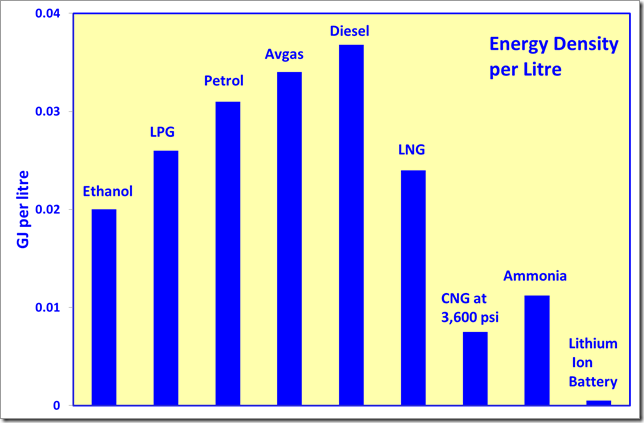 As a fuel, ammonia has about half the energy density of LPG and handles like LPG in terms of the pressures and temperatures of storage. Ammonia is better than having no liquid fuel at all and can be made from nitrogen and hydrogen produced by electrolysis. The cost of electric power determines the production cost. There are credible attempts being made to produce ammonia from wind power. Electrolysis could handle the swings in power output from wind which electric grids are ill-suited to. It is said that half the World’s protein consumption comes from synthetically produced ammonia. Until recently, the most competitive feedstock has been natural gas. But with the natural gas price internationally linked to the oil price through the LNG market, it is being displaced by coal as the preferred feedstock. 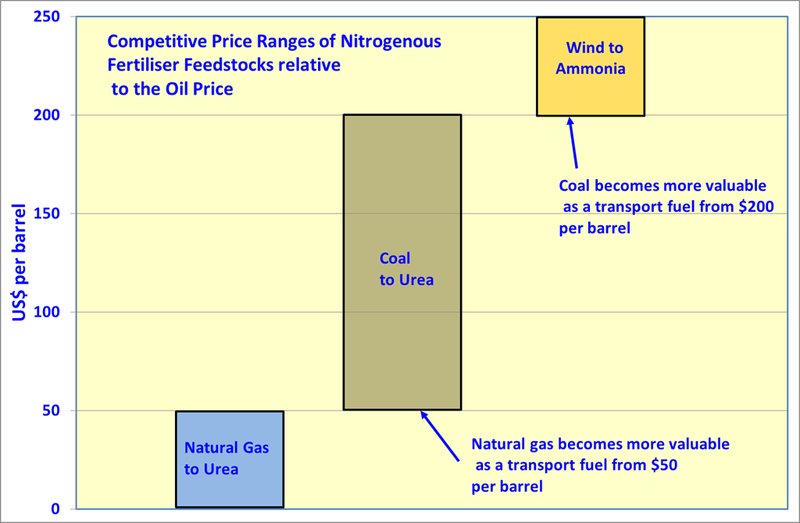 Coal-based urea plants have twice the capex of natural gas-based ones. The oil price that triggers a switch to coal is about $50 per barrel in energy equivalent terms. Above that level, coal is the preferred feedstock up to about $200 per barrel at which point wind energy may be viable and the coal has a high value use as feedstock for liquid fuels. In the longer term, the cost of nuclear power will be the main determinant of transport and agricultural operating costs. With China currently designing and planning on building 50 Thorium nuclear reactors, I have to wonder why that isn’t in the mix shown. Some wag said that we’ve had a fifty year supply of oil left for the last fifty years. Do the graphs include shale gas and oil? Do the graphs include any of the frozen methane at the bottom of the ocean? As I have said before, petroleum and even coal are much too valuable as raw materials to waste them by combustion. If (God willing) Andrea Rossi’s E-Cat really works, as I understand the L.E.N.R. principle, burning crude oil derivatives for thermal energy will a thing of the past. If it really is degasified nano-nickel and a few promoters reducing the Coulomb barrier, then larger units are obviously possible. It’s just a matter of simple heat transfer to avoid the nickel melting.and thus reducing the reaction area. Even the thorium molten salt reactors will be enormously non-competitive with nickel-hydrogen. If the US EIA’s report from earlier this year is to be believed there’s at least 3 times more technically recoverable natural gas in shale. With today’s technology. Assuming we can readily tap methane clathrates by the end of the century there’s no peak fossil fuel in sight. Finally, nuclear energy gets mentioned at the end. We don’t need to wait until 2050 to use it. People will be dying unless we maintain high per capita energy use. We should be using more than 2 or 3% of the fuel in a reactor load. The nuclear fuel is far too valuable to stash underground as a radioactive mess. We need to build integral fast reactors. Burn closer to 100% of the fuel and much of the waste. Several problems solved. Consider moving to LH2 fuel produced using nuclear power. With excess inexpensive energy, many currently impossible things become practical. I’m not really all that concerned about energy. There’s lots of options, and lots of technology yet to be discovered. Now…all the carbon sinking into the ocean where the plants can’t get at it anymore, that concerns me. Because that means… no more food. Ah, that is a projection and with all projections the future isn’t written in stone so therefore the above statement is not accurate to write with “is in” as if it is so. Something like “Peak production is projected to be in 2025 based on ___ projection” and fill in the source of the projection. Thanks. Energy Resources for the World Energy Council has the US with the largest coal reserves with 237, Russia was second with 157, and China is listed with 114 or 1/10th the reserves you are quoting. I wasn’t aware that China’s coal reserves had increased by a full factor in the last year or so. I would love to see the data behind an increase of that magnitude. Here is the 2010 report that I am quoting for top 3 national reserves. The specific reserves by nation start on Page 10. I believe the energy of the future will be fusion. We are close to break even already with fusion, another technology breakthrough or two and well be there. Plus, ammonia for autos? Hmm…. big problem with all that production of nitrogen oxides when burned, seems pretty much like a show stopper to me. More likely to be hydrogen or electric cars as I see it. A final comment, I think if we develop the vast shale oil deposits around the world that graph (oil portion) could be extended at least another 30-50 years. We should be spending 30-50 billion a year on fusion energy research, not the meager ~1billion a year currently allocated to insure that we make it to the next technology before the fossil fuels run out. Meh…sounds like we’re all gonna die. 2800 AD. AD=All Done? On the other hand: the Russians have a very plausible theory that “fossil fuels” are, in fact, the end product of the decomposition and subsequent reformation of carbonates deep in the earth’s crust under the influence of high pressure and clay catalysis. Having worked on synfuel production, and having analyzed the gunk that plugs the catalysts, I can verify that the Fischer-Tropsch process produces a product that is indistinguishable from “fossil fuels”. That being the case, and with the abundance of carbon sources in the crust, it would seem that it will be a very long time before we run out of “fossil fuels”. Wikipedia is telling a different story. They say that the U.S. is No. 1 in coal reserves. I realize that Wikipedia is not God. Their treatment of AGW is deplorable. And in general, they go along with ‘Establishment’ views on controversial subjects, while maintaining a facade of journalistic pseudo-objectivity. However I was not aware that coal reserve estimates were all that controversial. Do you have a reference in the scientific literature for your claim? The ignorance and stupidty of this statement is unbelievable. What are hydrocarbon fuels made from? What is the most common, and third (or is it fourth) most common element in the universe? All our descendents need is an industrial process and energy to combine them in a way that locks up liquid chemical energy. There is and will never be a “peak”. While I agree with the broad outline of your analysis, David, there are a couple of points on which I think you may not be quite right. You refer to the link between LNG and oil prices, yet my understanding is that the link between gas and oil prices has been broken in the US, due to recent discoveries of large volumes of shale gas. With the prospect of the US becoming an exporter rather than an importer of LNG, and other significant new gas discoveries in the UK, elsewhere in Europe and in Australia, it seems very likely that the international price link will soon be broken also. Second, I wonder to what extent your information on natural gas reserves has taken into account these new discoveries. There is no compelling evidence that the current cooling is solar-driven. We cannot tell at this point, e.g. http://www.leif.org/EOS/2011GL049380.pdf [ SNIP: Now that was just a tad ungracious and not relevant, don’t you think? -REP]: “One of the merits of using three separate data sets in a correlational analysis is that intercomparisons can be made. After treatment for removal of autocorrelation and nonstationarity through simple averaging and differencing, we find statistically‐significant secular correlation between sunspot number and geomagnetic activity. This is expected, and it serves as important support for our analysis method. On the other hand, after making the same treatment to the global surface temperature, correlations between temperature and either sunspot number or geomagnetic activity are not significant”. Yawn. Another peak oil scare story. What is the source for the forecasts and the methodology used? In addition to the earlier comment on where the shale gas and oil is, where is Putin’s oil hunt in the Arctic and the eventual opening of Mexican gulf waters? Ammonia to fuel vehicles? It’s used as an industrial refrigerant. When companies using it have problems, whether used for cold storage or in an ice cream plant, if the power goes out or something mechanical goes wrong, and the ammonia is vented as it expands, neighborhoods face evacuation. Yes I know this firsthand, really stinks up the area. And yes, the hazmat people get involved. And someday we could have ammonia refill stations as common as gas stations are today, with the expected underground tanks? I don’t think so. That prediction has been made again and again for the last 100 years and we have more proven reserves than ever. There are several proven processes to convert any carbon based waste into either natural gas or light crude (and they don’t require more energy in than you get out like corn based ethanol). The only problem is the stuff pulled out of the ground is still cheaper. When and if the reserves drop or the technology improves even further we will switch to recycling our garbage (and I predict even digging up old land fills) to get our gas and oil. 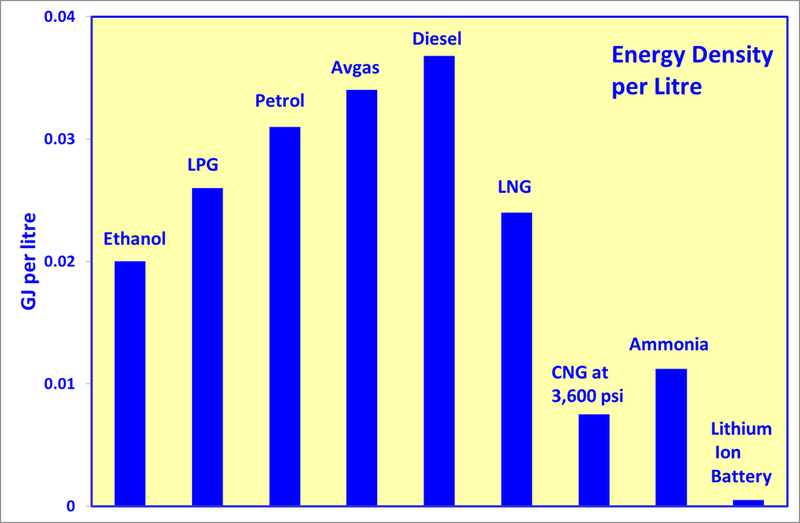 One of the reasons that it is so hard to switch from gasoline for cars is that gasoline has the highest energy density (Jules/liter) than any other fuel. Natural gas takes more volume, ethanol takes more volume etc. 5 years ago the idea of vast quantities of shale gas were laughed at (The Oil Drum is still laughing and looking like idiots). It turns out shale oil isn’t that rare either. There are many fields that were “uneconomical” with old technology that will be revisited. Hey, alternative view, while FT could happen in some places, it does not produce biomarkers, hopanes, steranes, etc. These are the same compounds that are in peat, coal AND oil. How much nitrogen and sulfur did you incorporate into your FT fuels? Not much, right? No, not at all. Anthony is, of course, entitled to post what he wants, but I do think that his avoiding of this is below his usual high standard. I’m with Steve Garcia ( Nov 13 5.32pm) on this one –the Chinese will lead the way with Thorium just like they have lead the way on many scientific innovations for thousands of years. I looked at the first graph and said to myself this is crap so didn’t read any further, I had just finished reading the prospects for shale gas for New Zealand and given the shale gas situation around the world well i ask you ……. OT – but relevant to Dr Archibald’s work. In a study of cyclic behaviour of the Sun, Russian scientists now predict 100 years of cooling. IceAgeNow reports that these are not just any scientists. This forecast comes from astrophysicist Dr Habibullo Abdussamatov, head of the Russian segment of the International Space Station, and head of Space Research of the Sun Sector at the Pulkovo Observatory of the Russian Academy of Sciences. In a study of cyclic behaviour of the Sun, Russian scientists now predict 100 years of cooling. IceAgeNow reports that these are not just any scientists. This ‘study’ is very poor and ignores recent work on solar activity. It is ‘coolist’ alarmism. Agreed up to a point but one can logically go a step further. That water which was ‘in equilibrium’ with some pre industrial CO2 level (some 800 to 1000 years ago depending on the actual length of the thermohaline circulation) is also of a slightly different temperature because of the different climate conditions at that time so it is not so much the CO2 content that is significant but rather the CO2 absorption capability of that water as it re emerges from the thermohaline circulation. A slightly reduced absorption capability from re emerging slightly less cold water would have an effect on atmospheric CO2 content and I think it is that slow oceanic overturning which provides the best fit for the long term relatively monotonic rise in atmospheric CO2 recorded at Mauna Loa. We can see from the seasonal variations in CO2 that the response to atmospheric temperature is very rapid but clearly something much bigger, slower and stronger is driving the background rise. That background rise has little relation to the variability of human CO2 emissions. I believe Murry Salby is going to put it down to changes in the CO2 absorption capability of the oceans and soil moisture on land which, if so. would suit me very well. Would the above affect David’s figures somewhat ? I first got interested in China’s coal reserves when I plotted up their production profile against the view that their reserves were of the order of 120 billion tonnes. Now that their annual production is 3,000 million tonnes per annum, the new power plants they were building were going to run out of coal before they wore out. Could the Chinese be so idiotic? The report you are quoting was created in 2005 with the newest information in its references as of 2003. Infact, that report is primarly based on information from the 2000 window of 11 years ago. In it, China was the worlds largest swing exporter of coal. However, if you read Bloomberg in 2011, China is arguably the largest importer of coal today. “China’s July coal imports climbed 36 percent to 17.53 million metric tons from a year earlier, sxcoal.com, a Shanxi-based industry portal, said on its website, citing Chinese customs data. Can you hazard a guess as to why China is ramping up its imports of coal when they have these massive undocumented reserves you are creatively quoting. Funny how all three peaks just happen to occur on 11/11/2011. Perhaps the time when the person making this baloney up had something to do with that, ya think? Not surprising. The only valid alarm we should listen to is the one that gets us up for work in the morning. The rest are pretty much fictitious and a waste of time. 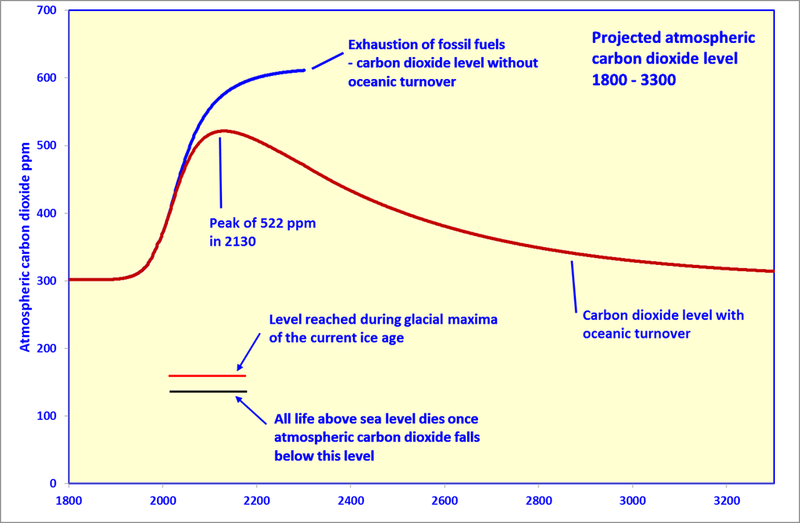 The CO2 levels shown in the first graph for the last ice age are not to be trusted as they tend to be 30–50% low due to traumatic changes, including microfracturing, as the ice cores are collected. Even so, CO2 was dangerously low, as it is still dangerously low even today. We will always be safer at levels in above 1000 ppm up to 4000 ppm. We would have lush crops and plenty of food, utilizing water and nutrients more efficiently than now. If ancient co2 levels were as high as 5000 to 7000 ppm, One would assume that not only did the oceans cope (and perhaps convert that co2 into oil) but perhaps the plant world overate. With current co2 levels at only 400 ppm, it’s humanity’s responsibilty set as much carbon free as possible. Heck, it may be our raisin d’être in the biosphere. Leif Svalgaard – thank you – I take your point. I’m not going to debate all this but I strongly suspect your numbers are light. The curves are flatter on the down slope. Other energy sources such as Uranium, Theorem, gas hydrates and so on are not properly accounted for. I would also remind that concepts such peak anything are way more complex then most published models suggest. I am old enough to remember all but BS that came from the doom and gloom produced by the “Club of Rome”. Except for population I don’t think many of their predictions ever came close to the mark. Models that are static and deal with well know static things are very good, we all know that and use them all the time. Models that deal with dynamic things are not worth the electrons to send them around. That we also know from experience. This kind of thing is valuable do not misunderstand me. We all need to keep a very skeptical eye or both open when dealing with these things that all. They range from 860 billion tonnes up to beyond 2.0 trillion tonnes. From the current level, it is pretty flat at about the rate. The link between the natural gas price and the oil price is only broken for the US because of the commitment drilling to keep the shale acreage. Most shale gas requires $8/gj or thousand cubic feet to provide a return. That will come. The shale gas thing will attenuate the decline, and I am a believer in shale gas because I am long a shale gas company. But shale gas numbers are a stab in the dark at the moment. For example, the USGS had 80 TCF on the Marcellus Shale at one stage then downed their estimate to 20 TCF. Shale gas and shale oil wells have vicious decline rates – down to 15% of the initial flow by year three. Going through the reference in the paper you cited, I see Hoyt and Schatten’s “The Role of the Sun in Climate Change”. On the first page of the introduction of that book is the story of Meton, living in Ancient Greece in 400 BC, who deduced a correlation between sunspot activity and weather based on his own observational evidence. Most coal is in the north, imports in the south. Same reason why they import iron ore when they have lots of it themself. But a little bit of Google work will find a range of numbers on what China’s coal reserves. A big Chinese coal reserve position does not fit the narrative that China is doing a lot in renewables. The Chinese are underplaying it because the idiot Europeans have been paying the Chinese to build windmills and dams. 30% of Chinese wind farms are not connected to the grid. So why did they build them? Because they did not pay for them. 1…number 1… Going after the cheapest energy for Homo sapiens. for green energy sources is foolish. Let the market do this. 2…number 2… Keeping atmospheric CO2 as high above 170ppm as possible. let the UN and governments all around to keep this hoax in the forefront. Thanks for the analysis. I would like to contribute a couple of things. Willem Nel (University of Johannesburg) analysed the available fuels as ‘peak energy’ occurring in 2050, with peak coal in 2070. Obviously some assumptions have to be made about future finds etc. Willem also arrived at a similar figure of about 530 ppm CO2 max for all known fossil fuels + 100% assumed still to be located. Certainly it will not get to 600 ppm unless it turns out oil is abiotic and produced under the surface of the Earth by heat, pressure and the plentiful H+C down there. Re the coal available – Mongolia has huge coal deposits (some seams over 100 ft thick) and they have hardly started looking yet. I was surprised to see the figure for the US being so low and the Mongolian deposits not noted (which are I think certainly larger than 250 b/tons). Heaven knows what is under Siberia. It is enormous and right next door. I have heard that many countries have downrated their coal reserves (see what Germany did) for political reasons and that the actual deposits are much larger than stated. They started reporting ‘recoverable’ coal which of course depends on price. It was used as an excuse to say tehre was ‘nearly none’ and raise the price accordingly because after all, the oil guys have been getting away with that (flimsy?) argument for years. The peak energy analysis also noted there is little Uranium available compared with Thorium. Geothermal looks good and on course there are vast hydro energy sites in Africa (far more than Europe generates total at the moment). I agree transport will be electric. It is just so efficient in terms of vehicle cost and maintenance. The fertiliser from electricity angle was interesting. the elite, how the masses? There is no compelling evidence that the current cooling is solar-driven. We cannot tell at this point…. But back to the point…it is dubious that we’ll see a flattening of CO2 levels, as their long-term direction is not driven now by natural factors as much as anthropogenic. Simply look to periods of global recession to see a temporary slow-down in the growth of CO2. It never actually flattens, but simply grows more slowly during these periods. >Can you hazard a guess as to why China is ramping up its imports of coal when they have these massive undocumented reserves you are creatively quoting. For the same reason the US chooses to import its oil: to use up what is advertised as a fixed supply of known dimension so your domestic supply will be the only resource left. China is buying coal from Mongolia for $12 per ton at the border. Why dig at home?? Since this is an energy post, I ran across an article yesterday about a company that is starting production on a new very inexpensive battery made of water, salt, carbon and manganese. Its founder and patent holder is a PhD at Carnegie Mellon and the company has got huge startup funding from the government and from the private sector. In addition to using extremely cheap materials, it is nontoxic, and because of its low internal causticity (I’m guessing here), it lasts far longer than ordinary batteries according to the manufacturer. It claims to have demonstrated >5000 life cycles of 100% depth of discharge with a target goal of >20,000. Follow up post to above…. We certainly heard it predicted during the 70’s. Soon to run out, peak oil. Only thing we ran out of was cheap oil. There was lots of the expensive stuff, even back then. The evidence is not there but past episodes of a quiet sun give strong hints, and I would say this is compelling enough to suspect a partial solar influence during the exceptionally quiet sun we’ve seen in the past decade. The past decade has had the same solar activity as a decade a century ago so we have been there before. And I don’t know of which hints you are talking. ‘Compelling enough to suspect’ is too vague for me. Either it is compelling or it is not. It is like being pregnant. I linked to a recent paper http://www.leif.org/EOS/2011GL049380.pdf that concluded that “After treatment for removal of autocorrelation and nonstationarity through simple averaging and differencing, we find statistically‐significant secular correlation between sunspot number and geomagnetic activity. This is expected, and it serves as important support for our analysis method. On the other hand, after making the same treatment to the global surface temperature, correlations between temperature and either sunspot number or geomagnetic activity are not significant”. So we have no basis for ‘suspecting’ anything. Wishful thinking is, of course, always allowed. More speculative dreams. No one can predicts what will happen in 2030 even less in 2050. Maybe we will have technology to extract more “fossil” fuels or maybe not. Or maybe we have but even more economically energies appear. Good grief! You put up a graph showing us to be near peak natural gas production???!!! It is just starting. Heck, the focus in shale production now is on wet gas, for the liquids. Oil companies are going to be swimming in gas as a by-product. And that is just the US. There is an entire planet of gas charged shale to be produced. Wikipedia has Mongolian reserves at 12 billion tons or over 100 billion elsewhere. Similarly India either has 60.6 or 267 billion tons (with note that this is second largest reserves). Canada lists either as 6.5 or 78 billion tons reserves. I think that we can say that the likely peak could occur in a number of years. P.S. the earliest reference I can find about “oil will run out very soon” was dated 1862 (3 years after large scale use started), but I believe that there was an even earlier one. Does anyone know of it? The real limiting factor at that time was not running out of oil, but running out of the whiskey barrels they used to store and ship the oil. I just saw a reference in one of the papers linked from the Weekly Roundup about German coal reserves. Lo and behold, they carefully mention ‘recoverable reserves’. They also sometimes use ‘proven’. Yeah, well, that is the perfect excuse to downrate the available coal. Germany itself (which produces the main surveys) used to have a lot of ‘hard coal’. Now it has nearly none with the stroke of a pen. Amazing. Where did it go? So the large variations you find are part of the coverup: there is NOTHING to be made by announcing the plentiful availability of coal. Nothing at all. We will never see oil running out, that will happen in a few thousand years…. The costs of nuclear reactors are mainly artificial. They (those costs) have been created for no other reason than to increase the cost of building them to provide a disincentive for doing so. A nuclear reactor could be extremely cost effective. If you have to conventional power plants and a reprocessing plant at the same facility, you never need to move dangerous nuclear material in or out after the initial fuel load. From that point forward you can power the reactor with natural uranium using the reprocessing breeder to create fuel. The amount of waste is greatly reduced and decays to background radiation levels in a few centuries. The problem of spent fuel disappears. We could be a lot smarter about nuclear power. If it was so much more expensive than other forms of energy, we wouldn’t use them on ships and submarines. If we cut the “lawfare”, nuclear power gets much more cost effective. David is probably right about China estimated coal reserves being out by an order of magnitude, because everyone’s coal reserves are probably out by an order of magnitude. The usually quoted 130 years supply at current rate of consumption is coal that it is technically feasible to recover (ie with current technology) at current prices. In reality there is vastly more coal than that. And mining is going through an automation revolution. Mines are opening here in Western Australia that have no underground workers at all. Its all done with remotely operated machines. I estimate there is enough coal to last between 500 and 1,000 years at current consumption rates. And in a few decades we could start using a larger proportion of our carbon in chemical synthesis, I expect. As reported, the still-unknown potential US customer (were they described as “potential” originally?) was impressed enough to accept delivery. Of a shipping container loaded with individual devices with many more mounted on the container roof? That’s acceptable? Rossi has also said on his blog that he’s since sold “more than two” devices to also-unrevealed customers. Wow, all these people buying these unregulated gamma radiation-generating nuclear devices. Guess if you want one you better buy it now, stay anonymous, and hide it away, before those meddling public safety officials take notice and confiscate all of them. The comments started interesting, and devolved into many posts by a few staunch defenders. Some even claimed this was old work, long ago demonstrated, and even that other “free energy” devices that were attributed as producing “hydrinos” (as with Blacklight Power) were actually doing what Rossi has replicated. A company named “Steorn” was given as an example of similar fraud. BTW, the Wikipedia entry is not kind to them. Devices were produced for public demonstration, didn’t work. There popped up a defender who claimed to have seen several proofs of Over Unity (more energy out than in). Another comment mentioned Steorn was now making water heaters, just like Rossi is doing. Strangely enough, the very next day over at that last WUWT Rossi post, eight days after the last comment with the post now forgotten, someone posted a comment with a link to the Steorn water heater info. It’s extra curious as nowhere else in the post and comments was Steorn ever mentioned. Was some company sprinkling references to “the competing technology” wherever on the internet there was mention of Rossi? With defenders of Rossi like this, placing him in such “illustrious company” as that, you would be well advised to be much more skeptical of Rossi and his E-cat device. Two essentially affine functions… How hard is it to get a good match between them by scaling and shifting? Answer: it is trivial. 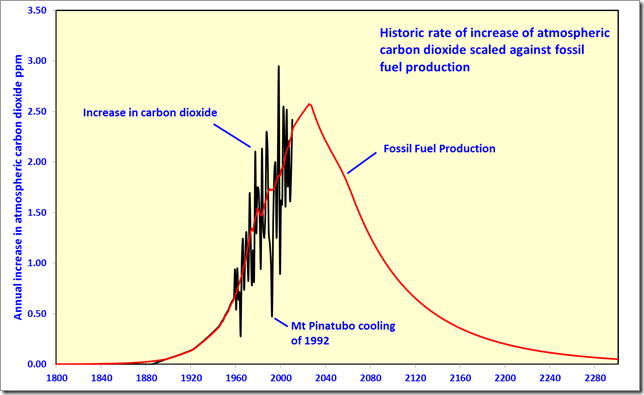 Moreover, the plot is of rate of change in atmospheric CO2 versus absolute fuel production. According to this reasoning, if we stop increasing fossil fuel production, we will still see rising CO2. This is really just an exercise in grasping for data to support a preconceived conclusion. Ha! It may seem one of the more trivial on the list, but we were just talking the other day about how just a few decades ago, The Jetsons were depicted as having screens everywhere, but they were still big bulky CRTs! Central Petroleum Ltd has recently found a coal field in a vast almost uninhabited area some 300 kms south east of Alice Springs in central Australia. The field extends for some 400 kms and is very conservatively estimated to hold 300 billion tonnes of coal plus. This is just one field with the possibility of more being found and is additional to Australia’s already huge coal deposits in Queensland. You havent factored in oil shale, tar sands, and shale gas. These will affect the shape of the graphs. I agree that the whole c02 thing isnt anything to worry about. Good article, but there might be quite a bit more carbon than your graphs show. 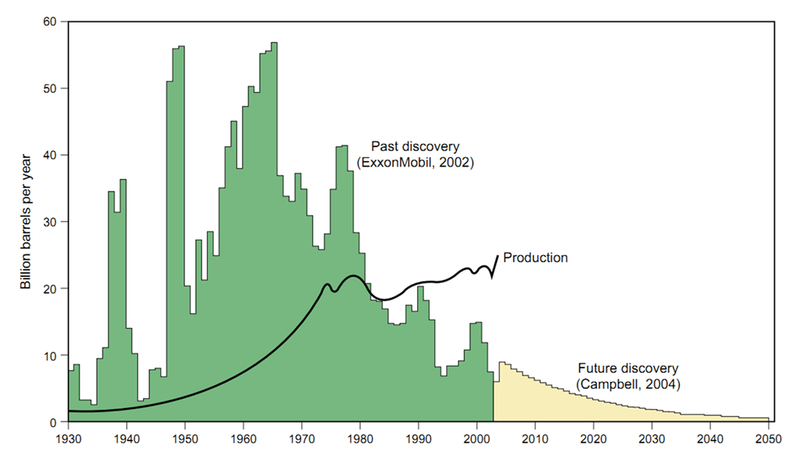 Peak oil production graph looks exactly like the one produced in the 1950’s and every decade since. That was wrong and this will also be wrong I suspect. The graph showing the connection between fossil fuel burning and atmospheric CO2 ignores the natural producers which provide 97% of this CO2. All this peaky stuff is nonsense. It was nonsense 300 years ago, it was still nonsense 50 years ago, it is nonsense today. The same old charts peddled by Malthus, then Lovelock, now Archibald. The point is not whether the fuel is available, nor whether it can be recovered, the point is….do the governments WANT the fuel ? In the UK we have an energy secretary who doesn’t like….energy. We have large shale gas reserves. We have native, and vocal and well-connected, environmental groups who have already started trotting-out the “causes earthquakes and pollution and gas out of your taps”. Taken together I doubt that even if we had several hundred trillion cubic metres of recoverable reserves…any of them will be extracted. It looks like the governments know the temperature is going to continue to drop. Not having any fuel means that many will die. I detect a distinct lack of government interest. CO2 increase each year doesn’t match human emissions each year very well and I think matching the CO2 increse to human fossil fuel production is mainly wrong. The only match you can make is that both has increased, year to year variability can not be explained and the divergence between CO2 increse and the accellerated increse in human emissions since 2000. If you match CO2 increase to global temperature you get a much better match, i.e. higher temperature causes more CO2 to be added to the atmosphere. To me it seems that the temperature is the main(not only) driver causing the CO2 increase, not the human emissions. The uptick in the end from human CO2 emissions aren’t vissible in the increase of CO2 each year. It just keeps following the global temperature rather well. Just as global temperature has stabilized since about 1998, the CO2 is not increasing at an accelerated rate and is hovering about 2ppm/year allthough the human emissions are incresing faster and faster. How does nature know how to compensate for our emissions if it is not the temperature that is the main driver of the increase? This diagram that I made a few years ago is not up to date but is still valid if you compare the latest years of CO2 increase at Mauna Loa with global temperature, it keeps following it. No accellerated increse in sight yet. Thanks for that info Philip. It was about time to come, similar case for nuclear operations & nuclear clean-up teams should bring a revolution there too. The oil projection is too optimistic. The depletion of oil will start not later than 2015. That will induce a crisis that will make CO2 emission go down (like 2008 or worst). After crisis will continue one after the other until all economy will collapse due to too high oil prices. Transports depends from oil. It will start by airplanes that will be grounded and after truck companies will stop one after the other. After that all industry without transports will collapse and people will die without food. All developed countries are in face of a strong challenge, and government does nothing to prepare on that. Just hope that no civil war will start. I looked at that Battelle pdf. It’s essentially a sales brochure for the full report, which costs 495 British Pounds. And yes, your figure for Chinese coal reserves jibes with that of the sales brochure. But they gave no indication of how they arrived at that figure, and no reason for me to take them seriously. Now let’s play Follow the Money. It’s in Battelle’s financial interest to inflate their estimate of Chinese coal reserves. Why? Because it puts them in a position to say: If you’re a business person, then ignore Chinese coal at your peril. By the way, you really and truly need to buy our report. You made the point that the Chinese leadership would be stupid to continue with their ambitious program of coal-fired power plant construction if they didn’t have significantly greater-than-previously-estimated coal reserves. Perhaps so. But that doesn’t rule out the possibility that they are in fact stupid. Although Capitalism has made significant inroads in China, they still have a top-down economic decision-making structure. And their policy-makers know even less about economics than Obama. And that is stupid. Human beings are adaptable. If we run out of oil, coal and gas we’ll just burn something else :). Thought I’d logged on to realclimate by mistake…. The most straightforward explanation of the interplay between reserves/resources/economics in relation to extracted raw materials that I’ve read is here http://remittanceman.blogspot.com/2008/02/mineral-reserves-and-resources-what.html?zx=9c8b9d29fe2e6a54 . It’s nearly 4 years old, but that makes no difference. Iignore the scary content warning, the blogger couldn’t be bothered to get it taken down and wore it as a badge of honour (honor). “The oilies have slightly different rules and definitions but the basic principle is the same. Ammonia is an excellent automobile fuel. But a society that must remove the word “acid” from low pH Miracid fertilizer won’t permit it…. I have not heard of nickel-hydrogen before. I believe the primary message of these “Peak Oil” alerts is that we had better start looking for a future cheap energy source sooner rather than later. That applies even if most of the earlier estimates have tended to be premature. Here is a two-hour condensed compendium of LIFTR promotional videos. It begins with a short, five-minute, introductory summary. I am *not qualified* to say if this is a viable project or just a way for governments to waste money; the concept, however, does sound very interesting and potentially practical. “Thorium is readily available & can be turned into energy without generating transuranic wastes. Thorium’s capacity as nuclear fuel was discovered during WW II, but ignored because it was unsuitable for making bombs. A liquid-fluoride thorium reactor (LFTR) is the optimal approach for harvesting energy from Thorium, and has the potential to solve today’s energy/climate crisis. LFTR is a type of Thorium Molten Salt Reactor (Th-MSR). This video summarizes over 6 hours worth of thorium talks given by Kirk Sorensen and other thorium technologists. Peak Death in Japan … “for some”. “People across most of the country should be preparing to bundle up. With many nuclear power plants offline since the accident at the Fukushima No. 1 nuclear power plant, electric utilities in some regions will likely face difficulties securing enough power this winter. Kansai Electric Power Co., which depends on nuclear power for more than 50 percent of its electricity generation, expects that its supply capacity will be 7.1 percent below peak demand in January and 9.5 percent in February. Similarly, Tohoku Electric Power Co.’s capacity will be 3.4 percent below peak demand in January and 0.5 percent in February, according to estimates. At Kyushu Electric Power Co., the ratio will be 2.2 percent in January. It costs money to look for fossil fuels. It cost more money to determine proven reserve. The parties that pay such costs are also interested in mining it sometime within a decade or two. We might run out of fossil fuels- some point. I don’t when. But if this post were to be correct or vaguely correct. What would mean if we for some reason didn’t develop future technology that provide the same or better benefits we are currently enjoying by using fossil fuels. Would we revert to using human muscle to work done fossil fuels- would we, could we return to how used to do thing several centuries ago? is a norm? How much is it worth not live always live in a finite existence. It seems to only real and final answer is we have leave this planet. happening at some point in our future. Now it it would enormously challenging to go to different star system. And at this point it’s hard to imagine that could vaguely worth the effort. It may be worth the effort 1000 years from now. But our solar system could provide near infinite resource- all resources human could need. The hardest part of using our solar system is getting to Low Earth Orbit. Something we done for decades. Our Moon is the gateway to this solar system. There lots minable water and that water can make into rocket fuel. The Moon is a lifeless vacuum. Which good news. If humans were sane, one shouldn’t need an environment impact report to do anything on the Moon. The is good place to store nuclear waste. And also a good place to operate nuclear reactors [shouldn’t need much much in terms seismic studies, etc or even a containment shield. And if reactor melts down- you lose a reactor- with not much other consequences. If in settlement, yeah it’s a problem. In terms of solar energy- the moon at least twice the solar energy density anywhere on the Moon compared best places on earth. And vacuum something created on earth in order to make ultrapure silicone needed for PV panels. There is no earth type weathering. There is a good view. Some lucky fools are going to get very rich doing business on the Moon- and no doubt some fortunes will be lost. The moon will be an exciting frontier, and as gets more cilvilized it we be one of the jumping off point to the rest of the solar system. The moon is a gaint port- it’s Hong Kong. And really all requires is passing some laws, it’s not a technological problem, it’s more a risk, one biggest risk is legal issues. And general for US it’s somewhere that there a lot potential for national economic growth- say within a couple decade it could adding say 2% to US economic growth. But I do not accept the basis for this question. We are almost literally awash in hydrocarbons that can be converted to the fuels **we want to buy**. And that is the key. For in the end, this is not an issue about ‘peak carbon’, it is an issue about economics. The the advent of technology like found in the ECat, and other devices that are sure to follow, we will make the economic decision to generate power in ways that do not involve burning something. We will decide to use hydrocarbon fuels where they are economically efficient. The decline in their use will lower their costs. Lastly, we do indeed have an almost limitless supply of hydrocarbons. One study I say stated that there were enough hydrocarbons in our sewage sludge to replace all oil imports if properly converted. The only issue is the cost of that conversion. More on Thorium Nuclear, probably our best bet at least short term if it does not get NIMBYed. The amazing thing about peak oil, is that every ten years, they move the date of peak oil out by 15 years. YES, the benefits of CO2 are KNOWN, and continue to increase at more then a linear rate, while the potential, maybe, always fails to manifest harm, DECREASES at logarithmic rate. AAs far as “peak oil”, well peak and you will find it. The operating and known reserves always go 30 to 50 years. Why? ; well because companies do not look further then that as there is no economic incentive. Nuclear, coal to liquid, shale etc, all will be available. And there is no evidence whatsoever that CO2 has anything to do with the recent warm spell. gbaikie, what nuclear waste? The vast bulk of it, all of the U238 and the various plutonium transuranics are all just new fuel waiting to be reprocessed. Why would we ever throw away all that useful, high energy density fuel? Dumping it on the moon is the most useless and most hazardous thing we can do with it. China has the largest coal reserves on the planet of about one trillion tonnes. The Chinese have 114 billion tons of ‘exploitable’ coal reserves. Vastly smaller then the 250 million tons of ‘exploitable’ reserves in the US. The average American or Australian coal miner produces in excess of 12,000 tons per year. The average Chinese coal miner produces less then 600 tons per year. If Chinese coal miners got paid something resembling a ‘decent wage’ the amount of economically recoverable coal in China would be zero. Crispin — If only our leaders were smart enough to use other’s oil while reserving our resources for later! Generally, we don’t think that long-term. We put our oil reserves off limits in order to appease certain special interest groups. There is also a belief that if we don’t have enough hydrocarbon fuels to meet our needs, “green energy” will magically blossom to meet all our needs (but only if we really believe, I suppose). ‘current cooling’ – ‘recent warm spell’ ? which one is it? As long as there is decomposition, decaying of organic materials there will be methane. Another important thing to think about is the case of carbo-di-amide (Urea) used as fertilizer: Usually farmers use Urea as a nitrogen fertilizer,( they use it A LOT) and they think that´s all what Urea is about, however it is not, IT PROVIDES CARBON in an assimilable form for crops, because CARBON FROM THE ATMOSPHERE IS SCARCE (just a few 350 ppm), and CARBON IS THE MOST IMPORTANT ELEMENT FOR CROPS AS PLANTS´BODY IS MADE OF CELLULOSE- A GLUCOSE C6H12O6 POLYMER- where H and O is taken from water. Before the first commercial thorium fueled nuclear power plant pays for itself harvest of solar energy will be cheap enough to make nuclear power too expensive to compete. The key is synthetic biology. Green plants have been harvesting sunlight and producing combustable hydrocarbons for billions of years. Green algae thrive using water that’s not otherwise usable for human consumption or agriculture i.e. municipal wastewater, brackish water, and sea water. We’ve barely taken the first baby steps in synthetic biology and several firms already have patents on genetically modified algae that can produce 20,000+ gallons/acre/year of liquid fuels competitive with oil at $30/bbl. Just 10% of area of the Texas panhandle used for this purpose can satisfy current energy needs of the entire United States. The Texas panhandle isn’t used for much of anything other than oil wells, windmills, and a few cattle. There is one person living there per 150 acres. We’ve barely scratched the surface in what’s possible in synthetic biology. Once it is mature the cost of harvesting sunlight and transforming it into hydrocarbon fuels will fall to pennies per barrel equivalent. It’s only a matter of time and it won’t be much longer. Progress in synthetic biology is taking place at the same rate it happened with semiconductors. No one is going to risk billions of dollars building nuclear power plants which will very likely never turn a profit because something else is in the pipeline which will render them unable to sell electricity at a profit. There’s a reason why all the energy we need isn’t being produced by nuclear power plants. They are expensive and cannot compete with gas or coal on a level playing field. Thorium reactors are even more expensive. There’s no such thing as a free lunch. In trade for enhanced operating safety, less hazardous waste to dispose of, and difficulty in using them to produce weapons grade radioisotopes, comes a higher construction and operating cost. L.E.N.R. would be lovely but as of this moment it’s considered not theoretically possible and in that regard it holds no promise whatsoever. The so called e-cat is almost certainly no more than a confidence scheme (a.k.a. “a con job”). Everyone is entitled to their own opinions. Archibald evidently thinks he’s entitled to his own facts. Armchair experts on the subject of resource scarcity tend to get it wrong more than the experts who also have to move the chains every ten years or so. Pretty graphs don’t make up for the lack of technical knowledge on sectors that are tech and investment heavy and with a fair number of unknown variables in the ground and on the consumer adaptation side of technology. Did the industry experts that pioneered shale gas competitiveness fully understand the global resource implications of their trial and error process of producing in the Barnett Shale? and did government resource modeling groups closely monitor this development? Probably not in both cases but the point it it happened by a process innovation and risk taking that was not in anyone’s model or on any pretty chart prior to that time. Unfortunately there are few costs for getting it wrong among armchair forecasters on subjects they have limited grasp of. They just fade away only to be replaced by the next supposed expert in the next short-term uptick in an inherently unstable market. Everyone misses the point in these discussions about peak oil. You’re right about availability and recoverability. There can be veritable oceans of oil and lots of clever new ways to extract it. However, it takes energy to get energy. The point is summed up in this question, “How much energy does it take to extract the oil?” Once it takes as much energy to extract a barrel of oil from the ground as the oil can deliver, then you’re done. You might as well sell the energy you control or put it into some other enterprise rather than putting it into extraction. Of course, long before you reach energy parity pumping out an oil field, the energy expense of transporting and refining the petroleum will match the energy delivered. Its about energy in – energy out, and all of your profits are tied to the energy expense. Hubbert predicted that the US would reach peak in the ’70s and switch from being a net exporter of oil to being a net importer of oil. It happened exactly as he predicted. As the US goes, so goes the rest of the world. Leif … do you have a reference to support your statement that there was a shortage of barrels in the 1860′S? Daniel Yergin: The Prize [The Epic Quest for Oil, Money and Power]. ISBN 1-4391-1012-3, page 12, line 9: “There was no shortage of rock oil. The only shortage now was of whiskey barrels and they soon cost almost twice as much as the oil inside them”. Note 7 to chapter one provides further support. Now…all the carbon sinking into the ocean where the plants can’t get at it anymore, that concerns me. Nice collection of hyperbolic web sites but you might want to at least check the year when the stuff was written. For instance the physorg link to the Hyperion portable nuclear reactors was dated 2008 and talked about orders for 20 units from some eastern european country and license review in 2009 by US nuclear regulatory agency. Since then the 2008 design was scrapped, a new design was produced in 2009, and there isn’t so much as an experimental prototype been built yet or a gram of fuel produced at the end of 2011. Don’t you think owe readers here just a tiny bit of due diligence? Just because you can post this kind of crap and waste people’s time doesn’t mean you should. It’s not exactly evil but it’s selfish and ignorant. Clean up your act. 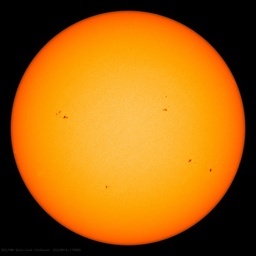 which is only loosely associated with the sunspot count, sometimes precedes it sometime follows, there is no specific rule, just go along time line 1650-2010, delay in temperatures you can associate with solar activity, but what about the temperatures taking off in advance( e.g.1700, 1820 etc)? Don’t forget the solar output isn’t just sunspots and TSI. Yes but you miss the point that the cost of extraction is continually reduced through technological advances. Why should anyone presume that extraction cost will suddenly flatline when it had been continually improving since the beginnimg of the industrial revolution? The first rule of batteries: There are liars, there are damn liars and then there are battery chemists. Having said the above, a cheap battery that lasts 5000 cycles is impressive. The energy density seems unremarkable. The web site gave 30 Wh/l. I assume that reads 30 Watt hours per liter. That’s not much different than a lead-acid battery. If the battery is cheap enough, even if its developers don’t achieve all their targeted values, it will find a market. Prior to 1859 (Drake’s well) oil was collected from natural seeps. In the 1600s . . .
“. . . this “mineral-oil” was used primarily for medicinal purposes and was reputed to cure many ailments, . . .” Depletion (if that is the right word) has been going on at an increasing rate since these early uses. So, when (@ 2:09 am) ‘Bob the swiss says’ The depletion of oil will start not later than 2015” … and that crisis after crisis will follow, he seems to be thinking of “peak oil” followed by a very rapid decline. The concept of “fungibility” springs to mind. Bob and fellow believers in his scenarios may want to investigate this concept. I expect to live beyond 2015 (Bob’s date) but being an optimist, I don’t expect to live sufficiently long enough to see catastrophe from lack of oil. Thanks for posting up that video. It’s probably the saddest thing I’ve seen in a long while. How is it that we can spend half a trillion dollars demonising the way we do things now and on alternatives that will never reach our needs, yet we can’t spend a few billion on something that will advance humankind immeasurably? How have we allowed the misanthropes to get such a level of power over us? So, the rest of the world are also net importers of oil… I wonder where all that comes from if everyone is importing…Outer space? Once it costs more to extract a barrel of oil than what people are willing to pay, then you’re done. Otherwise oil-based fuels such a gasoline, diesel and jet fuel will continue to be used because they are wonderful formats for storing energy. These fuels are energy-packed and are easily transported. At least Hubbert got one thing–the US because a net importer of oil in the 1970’s–right. I’m a synthetic biologist. You’re right. I was at the big Advanced Biofuel Markets Conference in San Francisco last week and some of the advances made recently have been huge. In addition to the algae developments, cellulosic sugar technology development has been outstanding regarding bringing down the price of feedstock. One presentation that stood out was from a guy whose company was going public, so he couldn’t talk about it (the fact that his company was going public should be a clue to the biofuel haters that this is a serious industry and they might want to think about getting up to speed). So, he graciously turned up anyway and gave a really excellent lecture on the concept of “biomass reserves”. When it comes online, I’ll link to it. The take home message was that if you do simple calculations, with conservative numbers, the “biomass reserves”, i.e. the amount of biomass that will be achieved over say a 21 year land contract (the number he used), is just enormous. For example, going from memory – for Brazil, it’s 4X the Saudi Arabian oil reserves. He also pointed out that Brazil has been growing sugarcane for 500 years (so why even stop at 21 years). The U.S. numbers were pretty huge too. Variations of solar output are due to the varying solar magnetic field, which is well described by sunspots and TSI and any other solar index [cosmic rays, UV, CMEs, F10.7, Ca K-line, etc, etc]. They all vary together. So, it is just sunspots and TSI, after all. I have scanned through the comments, and those who dispute peak oil are still making the same mistakes we covered the last few times this has come up. It doesn’t matter what’s in the ground, be it shale oil, shale gas, oil sands, kerogen, or deep ocean deposits. It doesn’t even matter if oil is abiotic (which has been well refuted http://static.scribd.com/docs/j79lhbgbjbqrb.pdf). Peak oil has always been about production rates. That is, flow rates. What counts is how fast one can extract the oil. New fields, these unconvensional deposits, cannot flow at the rates we saw with convensional sources. Older fields are declining faster than new fields are coming on line. For example, the Cantarell field at its peak produced some 2.2mb/day in 2004. Today, just 0.45mb/day and falling fast. By comparison, the Alberta Oil Sands is producing 1.5m/day. The most that is expected to be produced is 3mb/day in 15 years (Canada consumes 3mb/day, the US 20mb/day). By then, other older fields will be even further in decline, like Ghawar. The limiting factor for the oil sands is, ironically, another fossil fuel — natural gas. It is needed in vast quantities to cap the ends of the hydrocarbon chains as the synthetic oil is produced from the bitumen. Right now, the oil sands production consumes THREE TIMES the amount of NG that ALL of Canadian homes consume. This means the bulk of shale gas production will be consumed by the oil sands to boost production to the 3mb/day. So, please, all those who ridcule peak oil, please take note. We are not refering to geological peak. Peak oil is about flow rates. In spite of the new process, new production from unconvensional sources, flow rates will decline. These unconvensional sources will only mean that that slow production will last longer. Provided, that is, there is sufficient credit in the ecomony to build that production. The future of available credit is in doubt. No one is going to risk billions of dollars building nuclear power plants which will very likely never turn a profit because something else is in the pipeline which will render them unable to sell electricity at a profit. That is a very Mid Western US cost centric view. Globally the price of coal varies from 50 cents/MMbtu to $6.00/MMBtu. 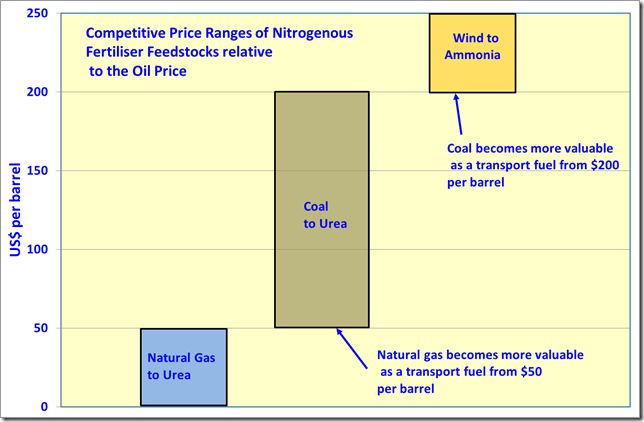 Natural Gas Varies from $3.00/MMBtu to $10/MMBtu. As well as substantial variance in delivered coal prices. The delivered price of coal in Florida is pretty close to $4/MMBtu and the delivered to electric utility price of natural gas is $6/MMtu. I won’t disagree regarding your definition of peak oil. It’s the imminence and implications of peak oil that are incorrect. These unconvensional sources will only mean that that slow production will last longer. Isn’t that exactly the goal of developing unconventional sources? Nice collection of hyperbolic web sites but you might want to at least check the year when the stuff was written….. I picked the other sites from chemistry, physics and Nuclear organizations because they were more “Neutral” towards Thorium than a site promoting Thorium. OK now you can fire both barrels again because the site I put up is BIAS. Thanks for posting up that video. It’s probably the saddest thing I’ve seen in a long while…. Very easy. Those who will climb over dead bodies, those without a conscience have a major advantage over the honest, especially if they also have intelligence, money and charisma. The warming that ended with the recent cooling, as you well know. From what I have read, that would be the Himalayas. Can we please have the energy density compared by mass instead of volume ??? Also, as a rule of thumb with regard to efficiency (and costs), it is always better to start with a highly concentrated source of energy (IE Nuclear) raher than trying to collect a lot of diffuse energy and concentrate it. (wind, ethanol, solar, etc). The IEA, CDIAC, EIA, EPA, etceteras? I don’t see any links to your data sources or your own data? Comparing the RATE of CO2 versus the TOTAL fossel fuel equivalent output? One normally compares RATE versus RATE, or TOTAL vs TOTAL, care to justify comparing RATE versus TOTAL? For some odd reason, you appear (or seem) to be saying, that the RATE of atmospheric CO2 will somehow EXACTLY follow the TOTAL fossel fuel equivalent output. Care to fully justify that apparent assumption? Care to fully justify TOTAL fossel fuel equivalent output out to 2300AD, you know like 289 years in the future? Just your own graphs and no links? your quote refers to a shortage of barrels at the advent of drilling. So? Shortages come and go. At the point I was referring to, the number of barrels was a limiting factor, at other times it is political factors, at other times something else. When was there actually a shortage of oil? rather than other factors being the real limitation at any one time. But keeping CO2 OUT of the oceans is our biggest problem…! I AGREE..! We need to KILL the UN’s IPCC….! And stay high above some CO2 low…is it 170ppm? GET more of this good stuff up there. Sort of a combination of the Texas Sharpshooter’s Fallacy and the Hot Hand Fallacy. Out of all the prognostications available, some had to be right, or nearly so. But, it is not necessarily predictive of future performance. Crosspatch at 11/13/1104pm has got it perfect… Nuclear is the answer..! Go up and read it! can start cell-fuel automobiles; the car companies are ready. How acidic will this much carbon make the oceans? Peak oil will undoubtedly occur, and it will only be recognized in retrospect, at which point it will be no big deal, because the peak will be the result of other energy sources having become paramount. People did not cease burning whale oil because of “peak whale”; rather “peak whale” occurred because a cheaper source of lamp oil became available. On another matter, some commenters like to slag oil from the Alberta Oil Sands by suggesting it is a waste of “high value” natural gas to upgrade the oil. But just as the hydrogen from the gas is added to the oil molecules to upgrade them, we could invert that to say that carbon from the heavy oil is added to the natural gas to upgrade it into light crude, precursor of valuable liquid motor fuels. Process heat is really incidental. I would take no issue with using nuclear reactors for process heat, as long as it could be done cheaply enough. But the environmentalist NIMBYS will certainly take issue. Unlike the anti-oil people I feel we need to exploit as much of the black gold we can. The problems we will face as a civilization will be two fold. Dwindling resources, and not just because of declining supply for geological reasons, but also declining supply to importing countries because of geopolitical reasons. Oil producing countries are also seeing an increase in their own consumption of their own oil. All it has to take is for one or more of these exporting nations to decide they will keep what is in the ground for their own future, and that means less available for importing countries, which means less flow on the global stage. It could also be used as a weapon. Imagine a mid-east country changing regimes (popular today) being run by radical extremists who decide to cut the west off as a means of crushing them economically. The second big problem with unconvensional sources will be credit. If we go into a prolonged economic credit crisis, lasting decades, like the 1930’s, there won’t be the capital needed to produce from these non-convensional sources. Oil won’t go to $200 a barrel, because below that triggers recessions, which drops demand, and lowers the price. So peak oil, the rate of flow, has a number of factors affecting it. High consumption Importing nations, like the US and the EU/UK are suseptable more than anyone. The US needs to take a leadership role, not possible with this administration, and move to LFTR as fast as they can. Or should the US import that technology from China too? Important caviet. I make no pronouncements on what the future will be. Then there is Iran, the nuclear wild card. >…It doesn’t even matter if oil is abiotic (which has been well refuted http://static.scribd.com/docs/j79lhbgbjbqrb.pdf). Don’t tell the Russians! 50% of their present oil exports are reputed to be because they have given up on the old fossil fuel idea and now explore on the basis of its being abiotic, for example east of the Caucasus. They even went to Vietnam (where hope was zero) and found oil based on the abiotic source idea. As for the declining rate of flow of new oil discoveries, you mean like the Deep Water Horizon strike and the huge one in Cuban waters that preceeded it? DWH was flowing at 100,000 bbl per day while half choked with a broken valve, bent pipe and stuffed with shrapnel. BP tried to keep it quiet for weeks refusing video coverage to hide the enormity of the strike (bad for business to tell people there is a lot of oil). The rumour is that there will be similar strikes just off the coast of Haiti. Oh, that too based on an abiotic genesis emerging through cracks at the edge of crustal plates. It is an idea probably worth considering even if it undermines the idea that it is fossil, limited and doomed to stop flowing soon. The idea that natural gas is NOT manufactured in the crust is silly. There is too much carbon down there not to generate a lot of methane. It is an unavoidable consequence of thermal decomposition of carbonaceous materials under high pressure. Finis and klaar. 2) The collapse of the USSR is thought to be linked to their loss of flow rates during that period. Technology was the problem, they didn’t have it. Now they have recovered, but appears to have now peaked in total production in Russia. Wow. Went looking for info on China’s coal reserves, got some seriously mixed Green and Warming messages at the Guardian. Vast reserves of coal in the far west of China mean it is set to become the “new Middle East”, a leading figure in the global coal industry has claimed. Fred Palmer, the chairman of the London-based World Coal Association and a key executive at Peabody Energy, the world’s largest privately owned coal company, also said that China is leading the US in efforts to develop technology to “clean” coal of its carbon emissions by burying them underground. China will be pursuing Carbon Capture and Storage (CCS)? There’s Dave Springer’s China coal reserves figure, at least. But all coal is not the same. Anthracite is nearly all carbon thus is very energy dense, and commands a premium price compared to other coals. If those massive Chinese reserves are even lower grade than lignite, common brown coal, it’s little better than burning peat. Indeed, by the Wikipedia coal entry there is no coal ranked lower than lignite but peat is listed as considered a coal precursor. Earlier this month, Peabody Energy confirmed it intends to build a vast new port in Washington state by 2015, to ship coal mined in Wyoming across to China. The plans have been strongly criticised by environmental groups in the US. Greg Boyce, Peabody’s chief executive, had said the port would export 24 million tonnes a year, but Palmer revealed to the Guardian that this “could reach up to 50 million a year”. Thus higher-quality US coal will be used instead of the Chinese coal in China. 1. Due to the energy required for CCS, using the tech will increase coal use, thus increasing coal sales. 2. Coal will be an important energy source of the future, at least for several decades to come. That’s an unavoidable economics fact. If it has to be made “Green” to be acceptable, then that’s what will happen. Which will result in someone raking in profits from what will likely become government-mandated, provided that enough or the right people don’t realize and accept it is madness. So CCS is a great technology to pursue, feel free to pay more for your energy if you want to be Green, but the government shouldn’t mandate anything that could lead to a de facto shutdown of coal use. And the Guardian said the Climategate emails were “illegally released” instead of stolen. Is that progress? Yes, of course, individual oil fields become depleted after years of exploitation. That is beside the point. New exploration opens up new fields. Since the 1970’s, we have A) by law, put a large portion of unexplored regions out of reach and B) been able to get oil cheaper from elsewhere. It does not mean we do not have the resources, any more than the fact that most of our consumer electronics come from Asia means we have forgotten how to build electronic hardware. It just means it is currently cheaper and more accessible from elsewhere. If it’s valuable who is buying it? Maybe it would worth more on the moon and they out bid any future earth buyers. It the moment it seems reactor fuel is fairly cheap, and therefore it’s common for parties to consider it cheaper to store nuclear waste. If the govt permitted certain qualified companies to be able take all nuclear waste. Because they were not going to store them anywhere on Earth but would have an easily veritable system that ensued all nuclear material was actually transported to the Moon. Would such a company have a market. In other words whatever the price [because it requires a market to determine a price of anything] and what I talking about creating a market where none exists. Are there parties that are more interested in not storing their nuclear waste? Would such a service be useful- would it lower their costs. By his own claims, Rossi’s E-Cat produces low-pressure steam and hot water. Not useless, but not suitable for driving steam turbines (or super-critical CO2 turbines either), so it’s not going to be an electrical power producer. We were all ready to start re-processing our “spent” nuclear fuel (SNF), when Pres. Carter shut down the facility with an executive order. Some nonsense about “setting an example”. Which no one else followed, surprise, surprise. Politics has blocked the waste repository (which the feds are obligated to provide) for decades, blocking it is part of the anti-nukes strategy for killing nuclear power. At this point, the best way to “dispose” of SNF is to use it up in molten salt reactors, do it on site so there is no transportation issue. The polywell and Deep Focus Fusion projects are still going, so far, neither have his any show stoppers. Yes, of course, individual oil fields become depleted after years of exploitation. That is beside the point. New exploration opens up new fields. Since the 1970′s, we have A) by law, put a large portion of unexplored regions out of reach and B) been able to get oil cheaper from elsewhere. It does not mean we do not have the resources, any more than the fact that most of our consumer electronics come from Asia means we have forgotten how to build electronic hardware. It just means it is currently cheaper and more accessible from elsewhere. All true, but has nothing to do with peak oil. All new fields will do is prolong the length of time for the over all decline. None of the new oil fields, including those yet to be tapped off shore of the US, will stop the world wide decline of supply rates because those new fields won’t be able to flow fast enough to keep up with the decline of old fields. The addition of the east coast won’t even replace what the US imports, some 10mb/day. Can some adress this simply. I am a beer brewer and the last thing I do is carbonate the beer. To get the same CO2 density in beer at 60F requires 23.1 PSI of CO2 and at 70F requires 28.8 PSI of CO2. 1 thing is quite obvious from this simple fact. CO2 changes will always follow climate change as the ocean releases way more CO2 than people. The ocean is the driver of CO2 levels. Because dumping spent nuke fuel on the Moon was an essential plot element of Space: 1999, which some find to be a bold and largely-realistic visage of human space exploration, highlighting mankind’s strengths in the face of cosmic adversity, and a preferable “everyone working together” (*cough*communist*cough*) society. Leif … you say “so?” The fact is, you were incorrect … in 1862, the limiting factor was not a shortage of whiskey barrels. 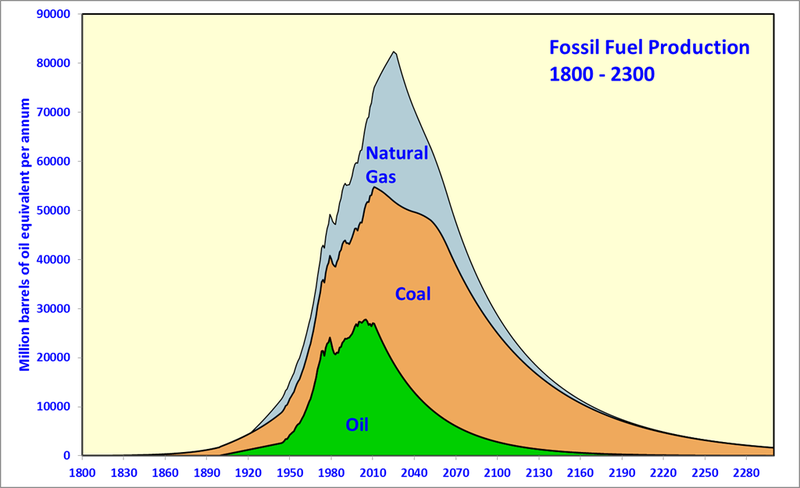 How long have we seen these ‘peak oil’ and ‘peak energy’ predictions…each one out 20 or 30 years, each one passing without the peak actually …well….peaking? I’ve been reading newspapers and science magazines and journals for more than 50 years, and have seen what seems to have been at least a dozen of these doomsday cycles. Such predictions are always accompanied by logical sounding calculations on how the peak is unavoidable and how ‘the signs are obvious even now’….its just that the production just refuses to peak as predicted. Can anyone tell me why this one is different than the rest? Does that mean that it takes eight hundred years for water to move from the surface of the ocean to the bottom, and vice versa, or that every eight hundred years the oceans leap up into the air and flip over like a wet pancake? If the latter, we’re doomed. Vladimir Kutcherov at the Kungliga Tekniska Högskolan in Stockholm has, he claims, proved that dead diatoms are not necessary for oil production, and that we are a long way from peak oil. It’s about time we had some polls at WUWT. Who here believes PO_isNow? Anyone independantly discovered the PO_isNow cult, got involved, and then found it to be a fraud? I read about peakoil_is_now back in 2006. It’s compelling. Once your a peaker, you get very involved in it’s material, like you’re in a cult. You have to dig quite deep to find that it’s a fraud, designed to play on the same society is about to collapse and it’s our fault mentality as AGW is. 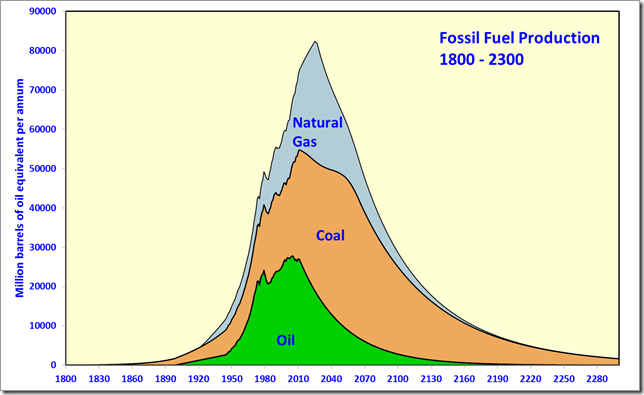 By 2008 I’d seen that peakoil is still a way off, and we aren’t as mortally dependant of fossil fuels as peakers will say ( nulcear power saves us, with its thousands of years worth of reserves ) but trying tell the others in the peak oil cult was impossible. x-peakers see peakers as a religious sect, just like AGWers. And like the AGW religion, PO_isNow is quietly propped up by big businesses who’re in positions to gain from rumours of scarce fossil fuels. I hope David will come round to seeing PO_isNow for the fraud it is. But a the mo his graphs have peak oil around 2010, which is wrong. I’ve been monitoring PO_isNow for long enough to have seen similar graphs, all have PO about the time when the graph was produced. There’s been graphs like this from the PO_isNow lot for decades. The simularity with AGWer graphs with the global temp flying off at around the time the graph was produced is no coincidence. They are both results from ‘world ends tomorrow’ cults. … because CARBON FROM THE ATMOSPHERE IS SCARCE (just a few 350 ppm), and CARBON IS THE MOST IMPORTANT ELEMENT FOR CROPS AS PLANTS´BODY IS MADE OF CELLULOSE- A GLUCOSE C6H12O6 POLYMER- where H and O is taken from water. ugh… that is not true. CO2 is the source or C AND O. Water is only the source of H. The extra O that the water molecule has is dumped into the atmosphere as O2. That is why the atmosphere is 21% O2 nowadays. It is the result of O2 being thrown away by photosynthetic organisms since the begining of life on Earth. ‘Peak oil’ is a myth. When theorized by Hubbert in 1956, peak oil was valid. It is valid today. It will be valid for decades to come, because new discoveries are keeping up with increasing demand. Will it be valid next millenium? Who knows, and who cares! … and CARBON IS THE MOST IMPORTANT ELEMENT FOR CROPS AS PLANTS´BODY IS MADE OF CELLULOSE- A GLUCOSE C6H12O6 POLYMER- where H and O is taken from water. CO2 is the source of C AND O. Water is only the source of H. The extra O the water molecule has is dumped into the atmosphere as O2. That is why the atmosphere is nowadays 21% O2. It is the result of photosynthetic organisms dumping O2 into the atmosphere. Go tell Yergin: “the only shortage now was of whiskey barrels”. With more barrels, the price would have dropped even further. Don’t forget that the greenies are upping the pressure on EPA to do something about fracking. It will be stopped for the same reason we haven’t drilled ANWR and the Keystone pipeline has been stopped: The left doesn’t want us to have any access to energy and desperately desires what success in that endeavor would bring. As for Jack Barnes’ question, China is so flush with cash, they have to spend some of it on whatever they can find to spend it on. Why would people who are building skyscrapers and then tearing them down and re-building them, whole cities worth, not import coal instead of mine their own? They have so much of our money it’s probably cheaper to import coal with it than to build places to keep the money. According to one estimate, (T. Boon Pickens) we are now extracting oil from the Earth at a rate of 85 million barrels a day. If we go back in time, say 85 million years–just before the end of the Cretaceous period, the Earth only needs to be able to produce about one barrel of biotic or abiotic oil a day since then to give us the supply that we are now depleting in a single year, or produce 100 barrels a day to give us a 100 year supply. Given the geologic ages that the Earth has had to build up the supply that we are now rapidly depleting, there is no reason to expect that this resource is being renewed, whether it is biotic or abiotic, at the rate we need to use it. As far as I know, there is no reason to think that we might one day discover a vast underground ocean of petroleum. The only real inexhaustible source of energy of which I have been made aware of is thorium nuclear. Another Peak Oil post. Sigh. Production curves are totally tied to the technological pattern under use. This is the flawed assumption. You could make the same type of curve for a man’s ability to produce food. Until he gets a cow. Or a tractor. Or moves to better farmland. Or gets new seed. This whole thing reminds me of the “in five years half our landfills will be closed.” fallacy. Completely bad analogy. Oil production is not just technology. Geology plays the primary role. Oil is not a pool in a void in the rocks. The rock is the matrix the oil is in, like a sponge. The ability to extract oil depends on the porosity of the rock, the viscosity of the oil, the pressure of underlying water table, depth, disolved gases, disolved metals, and other factors. Each oil deposit has a fixed amount of oil in it. Technology only allows for a little more to be removed. This happened at Cantarell, nitrogen injection boosted production. But all that does is mean the drop off of the depletion rate is steeper than if no technology was used. Hence the 15% decline at Cantarel now. Do you dispute that oil fields go into terminal decline? The vast majority of oil deposits come from a few narrow windows from the geological past, mostly from periods of great marine diversity. The oldest being some 400myo, while the youngest is about 30myo. Subsequent geology will depend on what the marine deposits become as an “oil” field. Due to its small footprint, I would expect this to be less of a problem than with any standard power plant. But most Green Earth people, especially after Fukushima, have an inherent objection to nuclear power of any form because it is associated with war, nuclear waste, and because it is not ‘natural.’ Given the demonstrations against the Canadian pipeline, the President must assume that any attempt by the Government to foster Thorium Nuclear development to be opposed by mass demonstrations. I doubt if any of the Republican candidates are now prepared to speak on this issue. In industry, I expect that the primary opposition would be based on non-compatibility with existing methodology. That is the same reason that the IBM compatible personal computer was declared to be the one and only standard business computer, even though there were other personal computer architectures extant with arguably better graphical operating systems. A billion barrels here and a billion barrels there and pretty soon you have the makings of a model revision forced on govt and academics by the pace of new industry announcements with real data. See for example the new estimate from Anadarko on the third shale oil reserve to follow the Bakken and Eagle Ford shale cases. With as many as ten of these rewrites to oil reserve history in only a few years in the US along, you could easily get to 200 billion new reserves excluding the middle east. Reality is moving much faster than perception these days and the armchair energy experts are even more ill equipped than usual. Re: jrwakefield you link to an oil drum posted article questioning the economics of shale gas plays that is itself not representative of the universe of evidence to the contrary. In fact the only impediment to shale gas at present is the collapse in prices caused by what?…..,,yes shale gas discoveries and ramping of production. This overshoot of production in resource markets is a common characteristic of the sector and occurs in many commodities and markets. In the liquids market the sector is turning quickly toward shale plays here there and everywhere and it will ramp even faster than the overshoot of natural gas because of the value difference and reduced drilling tech costs compared to the natural gas case that included refinement of the techniques as they went. That refinement process on drilling time and reduced support equipment is far enough along now to move faster than the natural gas case. Take heart that you are not alone in being out of date, even the presentations of CEOs from conventional oil drillers are being revamped while they play catchup on land positions! Re Spector, your concerns about rapidly depleting oil that took millions of years to produce is a common mistake given the fact that it has been four since we learned how to economically produce oil from the source rocks instead of chasing where oil moved with high-risk drilling for lucrative reservoirs in trap locations. Also keep in mind that the Hubbert model and those that came after it are based on the distribution of success rates and production profiles of those vertical drill holes and none from the new horizontal variety in source rocks with very different success rates. Get ready for the next rewrite of oil history, it’s coming. That has been a problem with much of Space- it’s being mostly regarded as government program. As result there hasn’t much vision portraying a non-communistic/socialistic future. It possible that communist China will strangely be needed to develop markets in space- just Russia put first private tourist into space. I am unaware of any such method depending on what you mean by ‘source rocks.’ In a response to a question about using his reactors to assist in the harvesting of the oil sands, Kirk Sorenson appears to be claiming, in effect, that energy from his LFTR reactors will be so cheap (add grains of salt) that he will be able manufacture transportation energy storage fluids such as methanol, dimethyl ether, and ammonia at less cost than today’s equivalent refined products derived from petroleum pumped directly out of the ground. I am sure that statement is substantially correct as it stands, but I was wondering how large this area is in proportion to that area already explored and exploited. In a larger sense, it does not matter if we hard-limit on energy extraction from the Earth next year, next decade, next century, or next millennium. It will happen and mankind should be ready for it. If we are there now, we should be prepared to see a zero-growth or slowly declining economy as the best that might be expected–unless we find an alternative energy source. Leif .. by 1862 villages of barrel makers had sprung up in oil producing regions making barrels specifically for oil production. The shortage of whiskey barrels refers to Drake’s first attempts to sell oil in the late 1850’s. A billion barrels here and a billion barrels there and pretty soon you have the makings of a model revision forced on govt and academics by the pace of new industry announcements with real data. See for example the new estimate from Anadarko on the third shale oil reserve to follow the Bakken and Eagle Ford shale cases. Read up about the geology of the Bakken. Estimates are that we will not recover more than 1% of what’s in the ground. You are still making the same mistake. Peak oil is not about what’s in the ground. It’s about how fast it can be extracted. Bakken will always be a trickle. If you understand it’s geology you will understand why. You miss the point of the article. Shale gas has high depletion rates, this is seen around the world. The main reason for the fall of prices for NG is the recession, less NG being consumed, lowers the price. The glut is not just because there is more supply, but also less demand. It won’t last as convensional sources of NG continue to deplete. You are still making the same mistake. Peak oil is not about what’s in the ground, but how fast it can be extracted. Oil shale will not have the same flow rates as convensional fields, hence will not be able to conpensate for depletion from those aging fields, and the ERoEI will be much lower from shale oil. The Alberat Oil Sands has an ERoEI of a mere 6:1. An oil field is not considered energy profitable (besides monitary) below 4:1.
jrwakefield is to the OD as gavin is to RC. 3 trillion tons of coal off Norway. Mongolia/China. Orinoco. Alice Springs. All game changers with more to come if history show us anything. A paradigm shift is under way even if environmentalists (and eschatologists) deny it and fight to prevent it. I just wonder what sorts of plants and animals used to be on Titan, to form all that methane. Powder River Basin coal has a high water content and an associated low BTU/lb content. 8,500 BTU’s/lb compared to 13,000 BTU’s/lb for Central Appalachian or Australian coal. It is also 1,000 miles from the Pacific Ocean. Coal Freight rates run at about 3 cents/ton mile. The ocean freight rates from the west coast of the US to China are an addition $35/ton. So to get $15/ton coal from Wyoming to China we have to add $30/ton for the rail transportation and another $35/ton for the boat for a grand total of $80/ton. $80 for 17 MMBtu(8,500 x 2000) = $4.70/MMBtu. The proposed coal port was going to have a capacity between 5 million and 50 million tons per year depending on who you chose to believe. China consumes in excess of 3 Billion tons per year. So 1,000 Megawatt coal fired plant requires 9,800 Million Btu’s per hour, it’s hourly fuel cost using imported Wyoming coal would be $4.70 * 9,800 = $46,000/hour. There are 8,760 hours in a year. for an annual fuel bill of $402 million. A Westinghouse AP1000 nuclear reactor built in China costs about $3 billion. The fuel cost for a nuclear power plant for a year costs about $40 million. There is a reason the Chinese have ‘shovel in the ground’ on 26 nuclear reactors with another 25 planned. They are pretty handy when it comes to ‘doing the math’. There is also a reason why they don’t have shovel in the ground on 500 nuclear reactors. They don’t currently have the professional expertise to safely manage more then what they are currently constructing. They just contracted with ‘Exelon Nuclear’, one of the largest US Nuclear Plant operators for assistance in training. The only people that believe the Chinese will be importing ‘massive quantities’ of US Coal are the investers in Peabody Coal and Climate Change advocates. Every-time Climate Change advocates blather on about how much coal Peabody Coal is going to export to China various investors end up thinking how much money that Peabody Coal will make. Peabody coal will make money exporting coal to China…until the Chinese get their act together on their nuclear build-out. If you believe the Chinese will take 20 years then invest in Peabody Coal. If you believe the Chinese will get their act together in the next 5 years Peabody Coal is a poor investment. JRWakefield is a professional “peak” oil advocate. That’s his advocation, it may even be his vocation, he goes to “peak” oil conferences — the whole nine yards. On his own blog, if you post facts & evidence which contradicts his agenda, he will delete your post. That’s the hallmark of a “controlled subject” the individual has an agenda to promote. And Sir Francis Drake has been credited with contributing to the doom of the Spanish Armada by destroying their stock of barrel staves in an action off the Cape of St. Vincent, May 21 — June 18, in 1587. Whether or not the depicted curves are really metrics having anything to do with supply, these curves are relevant as follows. They depict the likely price of fossil fuels. How can that be? Simply put, the price of these commodities serve as a leading indicator of population and hence demand. Population and demand will peak very soon, relatively speaking, no later than 2040 by my own conservative reckoning. If the economic collapse continues the peak will be even earlier, even earlier yet if the economic difficulties beget world war. The next world war will be far less fossil fuel intensive than the last one as it will be rocket powered. In any case, given the inevitable peak then decline in population, there is no way that current commodity prices can hold. Talk about a bubble! So then at least one elephant is in the living room. the “zero hour” of below 150 ppm of carbon dioxide coming sooner. Court of Law for Crimes against Humanity, as well as Fraud. Advocates like Stuart Haszeldine of Edinburgh University for instance. have closed down my pet CCS Project at Longannet in Scotland…..
See just one of the websites of this apologist for Carbon Witchcraft …. Longannet carbon capture scheme scrapped ! Seems like not every political Party in Scotland believes the Lies & Deceit. at the ukipscotland blog stories. I believe that a relentless decline of living standards and population is only inevitable if some insurmountable technical problem or social bias prevents a transition to thorium nuclear power generation. As far as I can tell, there is no other long term, sustainable option. It appears that we are using stored chemical energy in the Earth at a rate, which, in the case of petroleum, is now double the rate we are finding more. That is the real signal that the well is running dry. Spector: The portion of the schematic you linked covering future oil production is seven, going on eight years old. It is out of date and proved to be false. Production over that time span (2004 to 2011) slowly has risen (although not by much). Also the person who prepared that forecast is Collin Campbell, a well known “peak” oil promotor. I think the Energy Information Administration is really dropping the ball by not providing authoritative summary data for making charts like this. I have to depend on David Archibald’s reputation as a petroleum expert for assuming this chart is essentially correct. I note that the ‘past discovery’ curve shows diminishing minima around 1976, 1986, and 1996 and diminishing peaks around 1980, 1990, and 2000 — perhaps due to some decadal reporting process. I assume that there was another peak around 2009-2010. The important point, however, is that the current production/consumption rate has not been supported by new discoveries since 1980. The simplest explanation for this is that we are running out of new oil to find. According to Kirk Sorensen, there is no way wind and solar power can replace our petroleum resource, “not even close,” and the current nuclear energy technology is based on a uranium fuel that is as rare as platinum. U235 is the match that Nature provided to humanity to start the nuclear era. Currently used U235-burning light water reactors are burning through that match without lighting the fire. U235 is only 0.0014% of the nuclear fuel available to us. On top of that, not reprocessing the waste from those reactors is like living in cities before the invention of sewage. We are just sitting in our own filth. 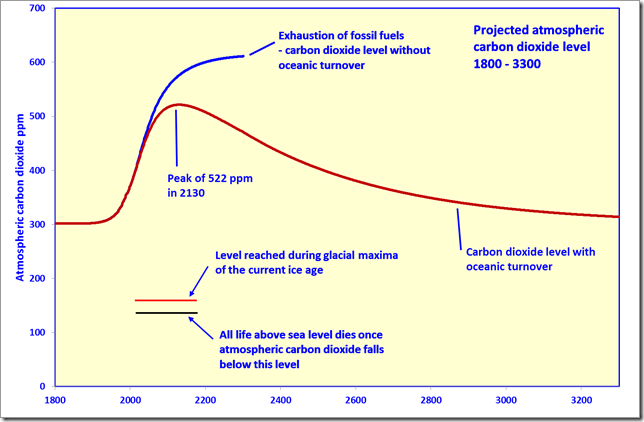 I had structured this post to determine what the CO2 content of the atmosphere would peak at and to see how fast it would be absorbed by the oceans. There is one big task remaining which is to determine the onset conditions of the next glaciation. RE: I had structured this post to determine what the CO2 content of the atmosphere would peak at and to see how fast it would be absorbed by the oceans. There is one big task remaining which is to determine the onset conditions of the next glaciation. I’m even more pessimistic than you are. I believe we are at the peak of population and demand (for all energy) is now or nearly so. Ocean absorption ought to become the prime (downward) mover of concentration in the atmosphere within the lifetimes of many currently alive (assuming those lifetimes are not shortened by war or starvation). Kirk Sorensen says his proposed continuously cycling Liquid Fluoride Thorium Reactors will consume almost all of their dangerous transuranic wastes. (plutonium, etc.) He says existing stocks of transuranic wastes can also be merged into the LFTR reaction pot and destroyed. Sorensen distinguishes between three types of reaction products: short-lived products that are very radioactive but are gone in a short time; moderate-lived products, like plutonium, that can remain dangerous for a million years or more; and long-lived products that only emit radiation at background levels. As far as I know, thorium is the only potential energy source that is *known* to be so abundant that it might sustain and support our current energy use beyond the projected life of the planet. I think his two-hour promotional video compilation above (November 14, 2011 at 3:20 am) is both educational and entertaining. I do not profess to know what the real limitations are, but it does look like we are long past the peak new oil discovery period. I have not seen similar data for peak new coal or new natural gas. 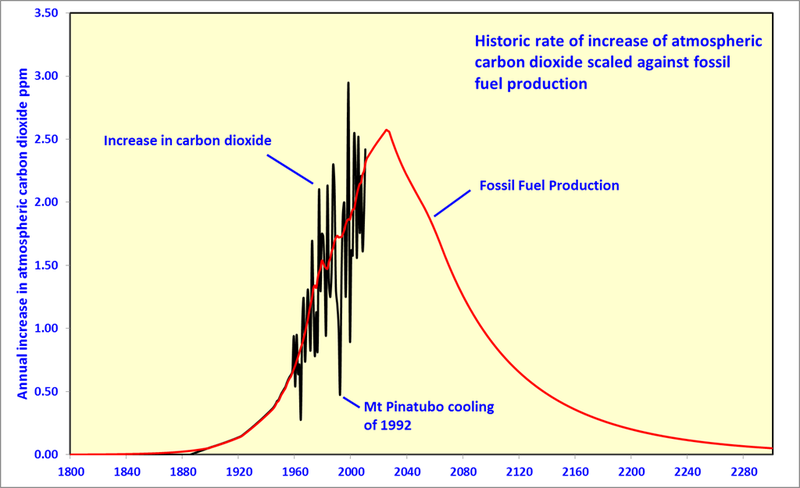 As plotted, it looks like your chart shows that man will not be able to double the CO2 content of the atmosphere (from 280 PPM) by burning the Earth’s entrained hydrocarbon fuels. I would guess, however, that there could be enough unknowns here to put a one hundred year uncertainty band around the ‘peak CO2’ date. If we transition to manufactured fuels, we might want to extract the carbon from the bottom of the sea to keep CO2 levels from falling in the atmosphere. I base my conclusions on the progressively declining discoveries of new oil supplies, which have not matched the oil extraction rate since 1980. The simplest explanation for this is that we are running out of new oil to find. I take that as a fair warning that we should be spending a small part of our treasure to develop a more sustainable alternative energy source. But it isn’t “our treasure” though is it. Whatever the rights and wrongs of what you surmise, there is no communal “treasure”. All “money” represents work and somebodies effort, and people cannot simply be taxed in order to fulfil the aspirations of some few who pontificate on things that “should be” or “ought to be” done. If and when oil and gas and coal, and whatever else become too expensive for the market, then the market will move on to something else. When these fuels become too expensive in terms of effort to extract, their extraction will decline. They will probably never all be extracted to to exhaustion, and so will never in fact run out as such. Many other fuels have yet to be exploited and others have yet to be discovered. Meantime, Oil, Gas, and Coal are convenient and relatively inexpensive, and so they shall continue to be used, whatever the various pontificators, green advocates, or anyone else says about that. When a person discovers a less expensive or less arduous to extract fuel source then humans will naturally start to use that instead. Many would argue that such sources already exist, but are being withheld deliberately because of vested interests. This is not something that anyone alive on the planet today needs to worry about though, or even anybody will need to worry about for at least 500, or perhaps 1000 years. Remember that just 100 years ago people still travelled about mostly on horses and until the 19th century, there wasn’t even any practical use for electric power. Have faith in the ingenuity of the combined inventiveness of billions of Human Brains. Actually, I agree with most of what you have said. I have seen that some people are investigating at least one promising alternative that does not involve the eventual return to a nineteenth century population and lifestyle. Of course, there are those who view that return as the only way to save the Earth from excessive human impact. It appears that we have wasted public money on wind and solar power schemes even though we have never been able to satisfy more than about one percent of our energy requirements that way. I think that money would have been better spent on something that did look like in could handle the load and would not poison the environment. There is another front on the peak oil issue. Former Canadian CIBC chief economist Jeff Rubin has been saying that we are facing ever-increasing competition from China and India. When someone at the top of their growing middle class starts to drive a car, he may be able to afford a price increase that will push someone in America back on the bus. Rubin has been telling his fellow Canadians that Asia is most likely to be the primary customer for their petroleum product. Re:jr Wakefield , I do understand the geology of the Bakken and resource econ. The only thing trickling associated with the Bakken is the transport capacity meanwhile the investment continues to flow in from both domestic and international sources from those who bet big with real money and not words. Promoters of the myth of imminent Peak Oil (McPeaksters) have made the same tired annual declarations since 1989 and like a broken clock, some time they can say with glee they were right all along! Geologic Peak would normally occur @ 105 Mbd, but current deterioration of growth rates in consumption make it rather clear this will be truncated (100 Mbd). PEAK Demand will be induced by crude prices surpassing $208 in 2029. The forcing for PEAK Demand is triple digit oil prices but ridiculous predictions of $225 by next year by neophytes like Jeff Rubin are outrageous. Along with James Hamilton and Steven Kopits, Jeff Rubin belongs to a fringe element that do not understand the concept of demand destruction wrt petroleum prices nor its price components. Hence their failure to foresee the 2008 episode was a mere spike and why there was no world Recession when oil rose above $86/barrel last year.